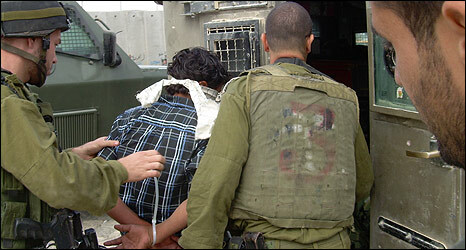 Israeli forces kidnapped two Palestinian civilians Wednesday morning from the West Bank. Palestinian media sources reported that Israeli troops invaded the town of Yattah near Hebron and kidnapped Hamza Hoshiyeh and took him to unknown destination.Meanwhile, Israeli border police assaulted Dia’ Abu Mezar in the old city of Hebron. Abu Mezar was moved to the Hebron Hospital for treatment as he suffered bruises in several parts of his body. In the northern part of the West Bank, an Israeli military invaded the city of Salfit and kidnapped Mus’ab ash-Shaab 17 after breaking into his house and ransacking it. Shaab was blindfolded and handcuffed and taken to an unknown destination, eyewitnesses said.